Each year, we report on our Global Citizenship activities and performance. Here's a summary of our 2018 activities. At Citi we believe that, thanks to our resources and expertise, we are well-placed to affect positive change in communities around the world. We are committed to engaging in important issues that affect our employees, clients and communities, speaking out in support of equality, respect and protecting our environment, and standing against discrimination and repression. We also make sure to listen closely to the local governments, nonprofits and community organizations that work on the front-lines every day. Most of all, we are committed to taking action. 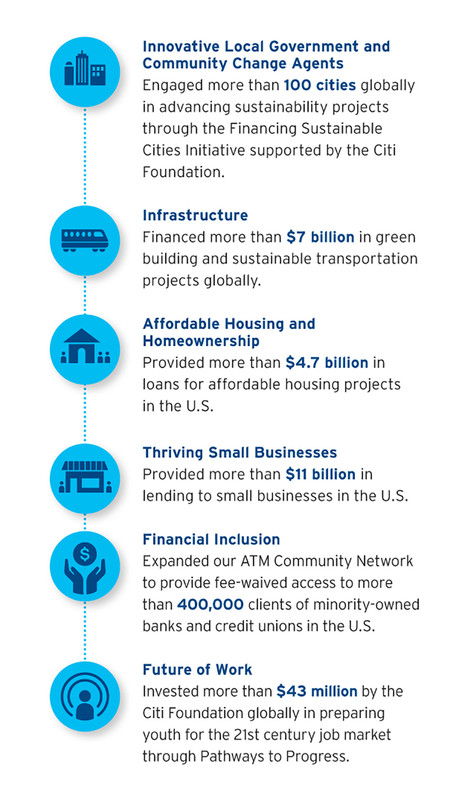 We are proud of the range of work we do — from infrastructure to affordable housing to jobs — to create more inclusive and resilient communities. This is by no means a comprehensive collection of our efforts, but rather a sample of highlights that aims to provide insight into how we deploy our products, people and financial resources to serve as an engaged problem-solver in our community, promote economic mobility and create an economy where households at all income levels have the opportunity to succeed. Cross-sector partnerships remain an effective way to tackle myriad of social and economic obstacles that prevent low-income communities and families from achieving financial security. We will continue to learn about and invest in the visions of NGOs that act as change agents in their communities and share what’s working and what’s not to accelerate progress in other communities. We will also work with municipalities and help support efforts that inform and improve service delivery and resident engagement to help cities run more effectively and provide economic opportunity for all.